I had right shoulder replacement surgery in October and took three months off from travel to rehab. Now, much to my delight, I’m on the road again for three-weeks in Antarctica, a slightly odd choice given my aversion to cold weather! In Ushuaia at the southern tip of Argentina, I board the Ocean Endeavor, a 200-passenger expedition ship heading to the Antarctic Peninsula. The first hurdle is crossing the Drake Passage, 900 km of treacherous open water in the Southern Ocean. We are told it can be a terrible crossing with much sea-sickness and misery for passengers but as the expedition leader tells us, we “dodged a bullet” experiencing neither fierce winds nor rough sea but rather relatively calm conditions. From the fine, knowledgeable, and entertaining staff, we are plied with facts about Antarctica, penguins, ice, Antarctic expeditions, and so much more. 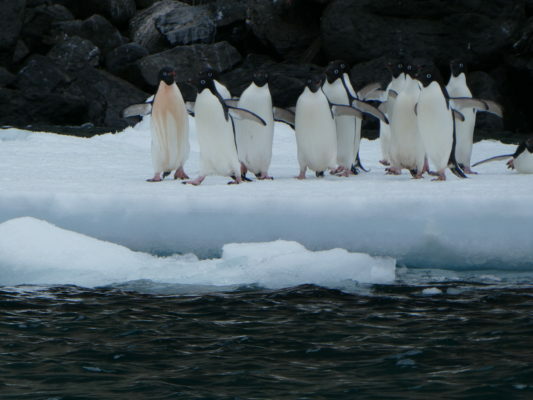 For example, there are nineteen islands that surround the seventh continent; there are eighteen varieties of penguins, not all of which are found in Antarctica; once the ship crosses the Antarctic Convergence, the temperature of the water drops four degrees Celsius with a corresponding lowering of air temperature and changes in sea life. 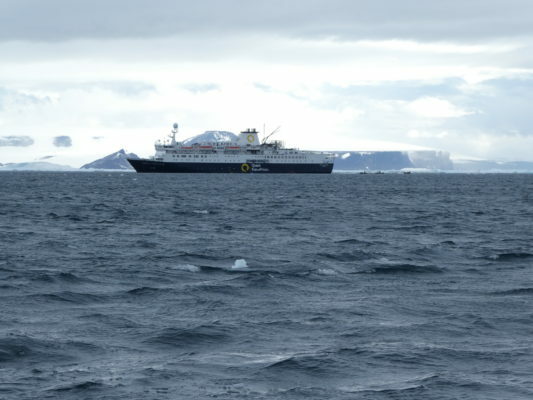 We arrive at Elephant Island where 28 members of Ernest Shackleton’s 1914 expedition survived until rescued five months after their ship, The Endurance, was crushed by ice in the Weddell Sea. The expedition leader calls us to the deck to see dozens of Fin whales surrounding the ship. Well, most aren’t too close and we can’t see much of their bodies (unfortunate, because they are second in size only to Blue whales), but we can see lots of plumes from their blowholes! 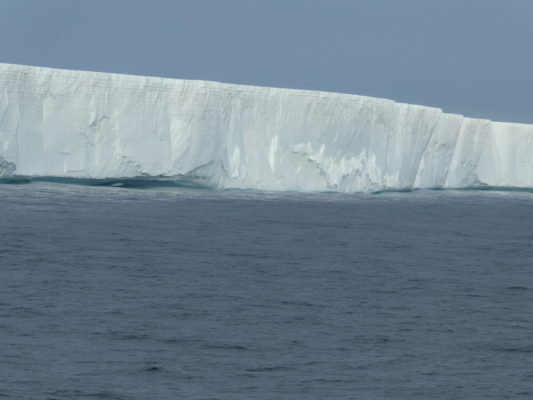 On the same day we see a tabular iceberg called B09F, a huge perfectly flat piece of ice originally 154 km long that broke off from the Ross Ice Shelf in 1987 and has been drifting in the Southern Ocean breaking into smaller pieces and melting ever since. We are told 28 meters lie above the water surface and another 200 or so meters below. The crew are joyful to see this, having not had the opportunity previously since most expeditions do not visit the eastern Antarctic Peninsula. 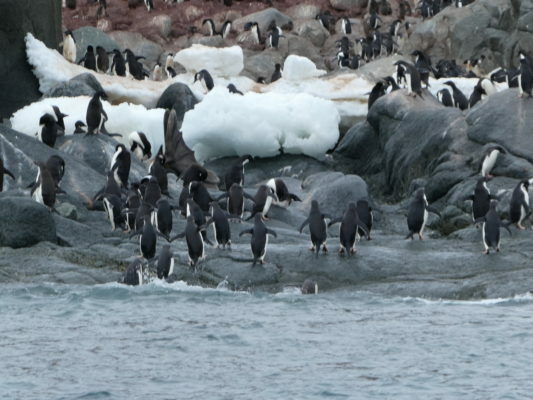 We disembark the ship and travel by zodiac among the icebergs to Heroina, one of the Danger Islands, and see many of the 3,000,000 Adelie Penguins, the largest such colony in the world. The smell of penguin guano precedes our arrival. Our guide tells us only one ship per year is able to reach these islands because of adverse weather and ice. Moving through the cold, clear ocean by zodiac, ice crunching beneath the boat, I am tickled at the sight of penguins at eye level, watching them waddle across the frozen surface and then slip effortlessly into the sea, swimming in large groups up and down in and out, then popping out again like toast, so charming and funny. 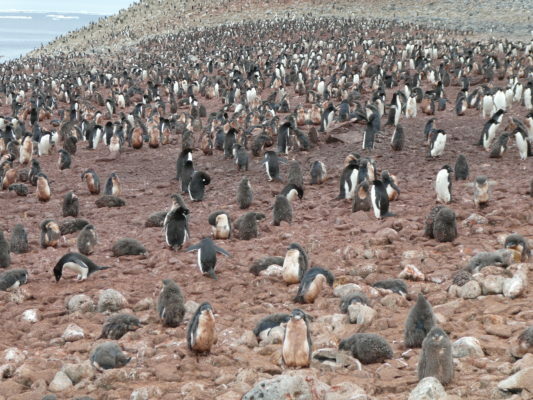 We alight from the zodiac on Paulet Island and spend time with many of the 100,000 Adelie penguins that inhabit this barren volcanic mountain. We come away with our clothes reeking of penguin poop! The zodiac takes us to a large sea ice floe (frozen sea water) where we play like children in the snow, mimicking penguin behavior. And I have now hiked in Antarctica-twice! We zodiac over to James Ross Island and hike in the snow to a high ridge affording excellent views of the Prince Gustav Channel below, surrounded by huge ice caps and glaciers on a gorgeous sunlit day. 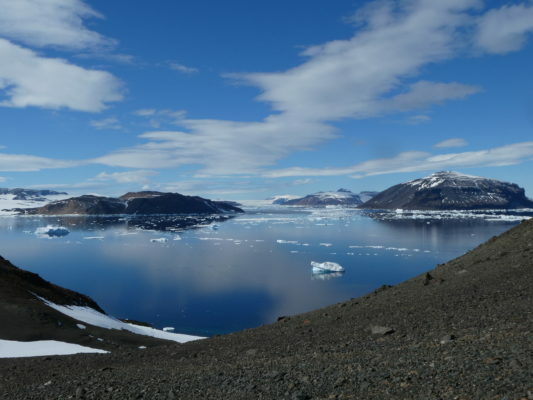 The following day we step foot on the Antarctic continent (as distinguished from the various islands we’ve visited) at Camp Hill and hike to a viewpoint of stunning beauty, the ocean and mountains drenched in sun, the glassy water sparkling below reflecting the landscape above. On the way back to the ship, we are thrilled to see humpback whales, and leopard and crab-eater seals so close to the zodiac. I take yoga classes each day and marvel at being in Warrior II pose while gazing at icebergs slowly passing by outside the windows. Living a city life, I am moved by the solitude in being on the only ship, among the only humans, in this vast, cold, dramatically white and wild place. Keep the postcards coming! I haven’t traveled out of the country since Cuba–only vicariously through you! Looks like you had a fabulous and fortuitously wonderful trip! Thanks for your amazing photos. I have a friend (went to high school with Nate) who is down there now working on one of those expeditions. Her name is Alex Van Nostrand–dirty blonde, brown eyes, big personality–just wondering if you were possibly on her boat. Sorry you had to have the shoulder surgery but glad you are doing well. Hope to see you again one of these days! Magnificent! And the yoga is great for your recovery. Amazing journey… I enjoy so much reading your postcards… Greetings from snowy Sarajevo! Well dear friend, another trip of a lifetime and as usual, beautifully described and illustrated. Your travel choices are so diverse and this one must have been a bit life changing. Except for the penguin guano, all sounded amazing. Adele, I always learn so much from you. Who knew penguins are so stinky. Thanks for sharing another amazing adventure.